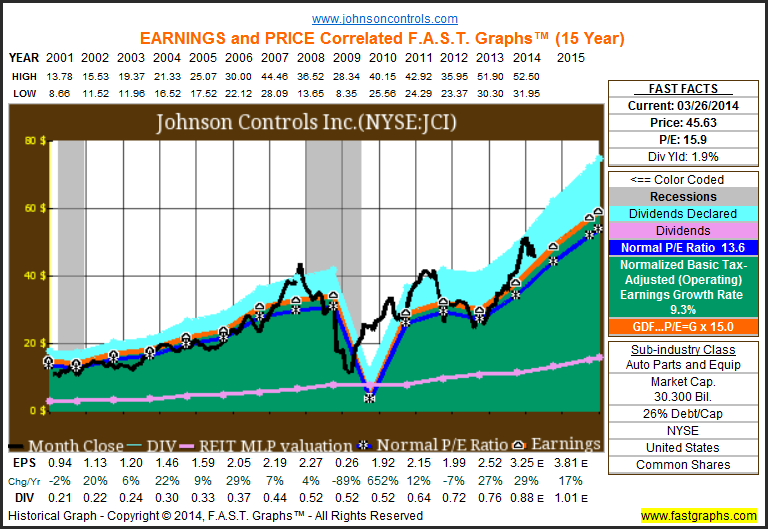 Johnson Controls: Back To Consistency? Johnson Controls (JCI) traces its roots back to an interesting bit of history. One hundred and thirty-one years ago, Warren Johnson was a professor in Whitewater, Wisconsin. It was here that he invented and installed the first electric tele-thermoscope – known today as the thermostat – in his classrooms. The invention served a dual purpose: it kept his students more comfortable and put an end to the hourly interruptions from the janitor checking the rooms’ temperature. Of course we can’t confirm this, but it would be our guess that Professor Warren was a regular student favorite. Shortly thereafter the Johnson Electric Service Company was launched in 1885, and in the coming decades the business brought evenly regulated temperatures to buildings around the world. Today the company is known as Johnson Controls and still has a hand in global temperature regulation. For instance, Johnson Controls’ “building efficiency” segment contributes roughly a third of Johnson Controls’ sales by increasing energy efficiency for more than one million customers in the heating, ventilating and air-conditioning areas. However, Johnson Controls has diversified greatly such that the roughly half of its business is now derived from the segment “automotive experience” – with 240 worldwide plants, a global capability to supply more than 50 million cars per year and a focus on seating, instrument panels and interior electronics. Finally, roughly a seventh of the business is classified as “power solutions” where Johnson Controls supplies over a third of the world’s lead-acid batteries to major automakers. If you put it all together, the corporation has grown from a single idea in the 1800’s to a $30 billion company with about 170,000 employees, 1,300 worldwide locations and sales of $42.7 billion last year. Furthermore, the company also announced a $3 billion increase in its share repurchase program which it intends to execute over the next few years. So the propensity to reward shareholders is quite high. With that, let’s take a look at the company’s past operating history along with how analysts are presenting viewing this company through the fundamentals analyzer software tool of F.A.S.T. Graphs™. We have already described the company’s steady history, but here we can see that Johnson Controls had been a very consistent company up until the most recent recession – in fact, revenues had increased every year for 62 years until the financial crisis. Yet unlike other very consistent companies – for instance Wal-Mart (WMT) or Johnson & Johnson (JNJ) – whose profits barely noticed the recession, Johnson Controls’ business rode the cyclical automotive wave and took it on the chin. Earnings per share dropped from $2.27 in fiscal year 2008 to just $0.26 in 2009. Moreover, it took the company four more years to finally eclipse its previous EPS record mark. However, the long-term picture is a bit more reassuring. Since 2001 earnings have grown by about 9% a year and since 1996 the number has been closer to 12% per annum. When we look at the performance results, it’s clear that the recession didn’t permanently impair Johnson Controls’ business. A hypothetical $10,000 investment at the end of 2000 would now be worth about $52,000. More than that, an investor would have received roughly $7,000 in dividend income as well – bringing the total annualized return up to 14.4%. This compares to the S&P 500 returning just 3.6% during the same time period. Furthermore, we think it’s important to underscore the dividend per share column. 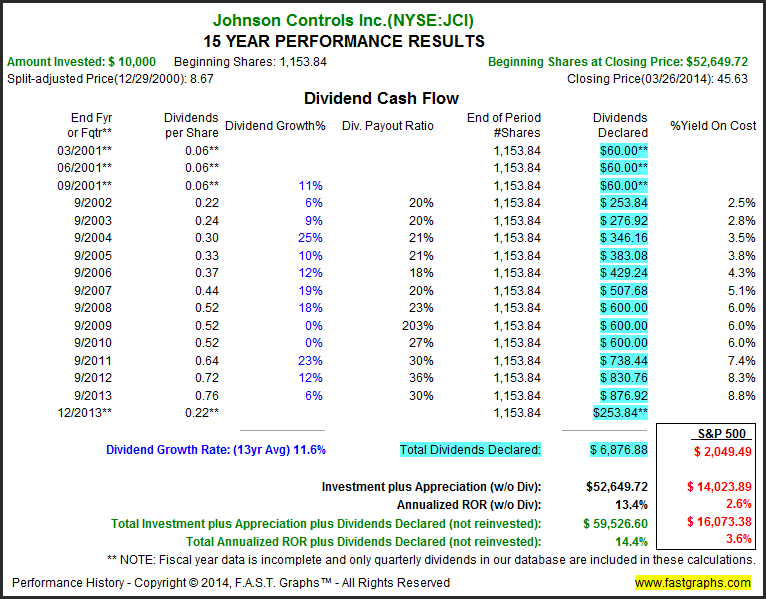 As discussed above, Johnson Controls was forced to freeze its dividend from 2008 to 2010. However, notice that this was a freeze rather than a cut. Despite the seemingly bad news for shareholders, a patient investor at the beginning of 2008 would still have seen their income increase by about 9% a year since then – despite 2 years of stagnation. Even great companies can run into short-term problems, how they emerge is sometimes more important than how they got into the situation. From a historical standpoint everything appears solid – despite the recession blues. But alas one cannot prudently make investment decisions by always looking through the rearview mirror. Thus it’s paramount to also consider the company’s prospects moving forward. One way to accomplish this is by viewing the Estimated Earnings and Return Calculator provided by F.A.S.T. Graphs™. Here we see that Johnson Controls is presently trading at a blended P/E ratio of about 16, with a 1.9% dividend yield. More importantly, notice that analysts are projecting much higher EPS in the next couple of years along with a longer-term growth rate of almost 15%. 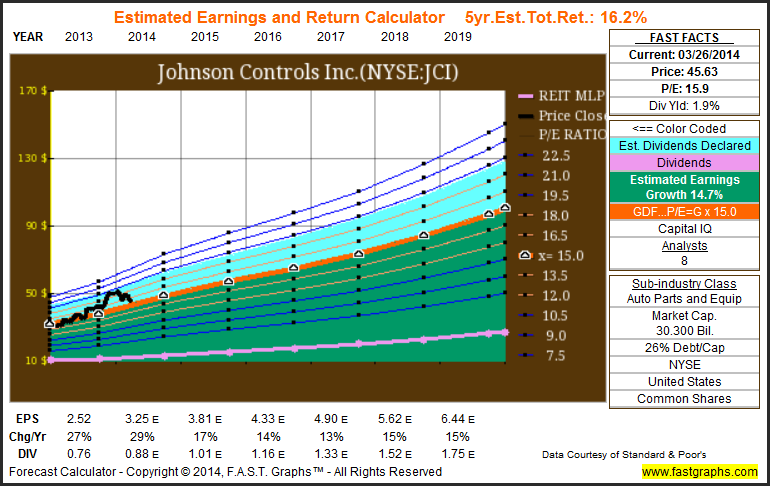 If the estimates materialize as forecast – and Johnson Controls trades at a 15 P/E multiple in the future – this would represent a roughly 16% annualized 5-year total return estimate including dividends. When other sources are considered these estimates appear more than reasonable. However, this is certainly not to suggest that this is an absolute – the above is simply a calculator based on analysts’ consensus estimates. The company could experience more hardship in the future and continue to be subject to the whims of the cyclical automotive market. More than that, any one of the company’s 16 “general” risks and 17 “specific” risks listed in the firm’s 10-K could materialize. For that matter, a risk outside of the 33 mentioned could formulate. It’s important to remember that there is always risk involved in owning an equity investment. Taken collectively, we have found that Johnson Controls has been a remarkably consistent company with a nice story spanning back to the 1800’s. It is true that the most recent recession caused Johnson Controls to temporarily stumble, but it appears the company has gotten its feet back under itself. In the future profits might be more cyclical than they had been, but we still find the underlying business prospects to be favorable. Today’s valuation is slightly higher than it has been historically, yet it might be warranted if earnings materialize as forecast. As always, we recommend that the reader conduct his or her own thorough due diligence. Disclosure: Long JCI, WMT, JNJ at the time of writing. This entry was posted in FAST Graphs At-A-Glance and tagged JCI, JNJ, WMT. Bookmark the permalink.